TSUNAMI, a Japanese word whose characters translate as “harbor wave,” has become the internationally used term that refers to a series of waves traveling across the ocean with extremely long wavelengths (the distance between wave crests), considerable length, and high velocity. The image most people have of a tsunami is a large, steep wave breaking on the shore. This image is hardly, if ever, the case. Most tsunamis appear as an advancing tide without having a developed wave face, resulting in rapid flooding of low-lying coastal areas and causing them to often be referred to as tidal waves, but they have no connection with the weather or with tides. A tsunami generally consists of a series of waves, often referred to as the tsunami wave train. Much of the damage inflicted by tsunamis is caused by strong currents and floating debris. The small number of tsunamis that do break often form vertical walls of turbulent water called bores. Tsunamis will often travel much farther inland than normal waves, given the tremendous volumes of water involved. Tsunamis are comparatively rare events, occurring every 25 to 50 years in Hawaii, for example. Most tsunamis are generated by shallow earthquakes in subduction zones, where the Earth’s drifting plates that make up its outer shell, or lithosphere, converge, and the heavier oceanic plate dips below the lighter continents. The only subduction zones around the Atlantic are the Puerto Rico Trench and the Antilles subduction zone around the eastern Caribbean and the South Sandwich Trench south of South America. These subduction zones are both smaller and much less active the subduction zones that circle the Pacific, so the Atlantic has many fewer tsunamis. Most tsunami events are restricted to the Pacific basin, an area surrounded by volcanic island arcs, mountain chains and subduction zones that have earned the region the nickname the RING OF FIRE. Tsunami waves can also be created by volcanic activity or by landslides that might occur both above and below the sea surface. In fact, the most deadly tsunami in recorded history followed the eruption and virtual obliteration of Indonesia’s Krakatoa Volcano in 1883. But generally, these types of tsunamis have much less energy than those produced by submarine faulting, and their size and energy dissipates rapidly with increasing distance from the source. On the open ocean, tsunami waves can approach speeds of 500 mi per hour (800 km per hour), about as fast as a passenger jet. In deep water, the waves spread out, with hundreds of miles between crests making them scarcely noticeable from the deck of a ship. But in fact, the tsunami crest is just the very tip of a vast mass of water that has been put in motion. Though winddriven waves and swells are confined to a shallow layer near the ocean surface, a tsunami extends thousands of feet deep into the ocean. Because the momentum of the waves is so great, a tsunami can travel great distances with little loss of energy. 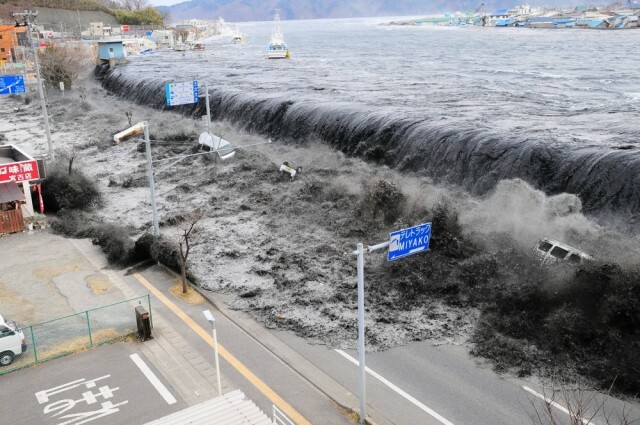 As the waves in the tsunami reach shore, they slow down due to the shallowing of the sea floor, and the loss in speed is often accompanied by a dramatic increase in wave height. Depending on the geometry of the seafloor warping that first generated the waves, tsunami attacks can take different forms. In certain cases, the sea can seem at first to draw a breath (runup) and empty harbors, leaving fish flopping on the mud. This sometimes draws the curious to the shoreline and to their deaths, since the withdrawing of the sea is inevitably followed by the arrival of the first tsunami wave. Regardless, the incoming wave approaches much like the incoming tide though on a much faster scale. Given the huge mass of water behind a tsunami run-up, the waves then inundate the coast, snapping trees like twigs, toppling stone walls, and smashing houses, buildings, and anything else in its path. Because major tsunami events are rare, we tend to forget the devastating power and destructive force they are capable of. In addition to the recent, December 26, 2004, devastating tsunami in the Indian Ocean, there have been a number of other major events over the past 75 years. These include the 1929 Grand Banks Tsunami near Newfoundland that was triggered by an undersea landslide and the 1952 Kamchatka Peninsula Tsunami that overran Midway Island with one meter (3.28 ft) of water before hitting Hawaii. The Island of Kauai, Hawaii, was hit twice as hard by this tsunami as it was by the Aleutian Islands tsunami in 1946, and the run-up at Haena reached 16 m (50 ft).